The government's top bailout watchdog accused the Treasury Department on Monday of failing to rein in "excessive" compensation at AIG (AIG), General Motors (GM) and Ally Financial. Christy Romero, Special Inspector General for the Troubled Asset Relief Program, or SIGTARP, says in a new report that the three bailed-out firms "continue to lack an appreciation for their extraordinary situations and fail to view themselves through the lenses of companies substantially owned by the U.S. Government." The companies, she said, have argued that competitive pay packages are necessary to retain top executives. "[W]hile historically the Government has not been involved in pay decisions at private companies, one lesson of this financial crisis is that regulators should take an active role in monitoring and regulating factors that could contribute to another financial crisis, including executive compensation that encourages excessive risk taking," Romero's office said in the report. Under the 2008 law authorizing the bailouts, the Treasury Department was tasked with overseeing compensation for top executives at firms that received government support. Officials in charge of this oversight have said compensation for the executives at these firms should be around the median for employees of similar rank in their industries, according to SIGTARP, and have called for limiting cash awards in favor of restricted stock. The goal is to better align employee incentives with the long-term health of their companies. But Romero says the Treasury Department repeatedly authorized plans by the companies for large compensation packages with sizable cash portions. In 2012, Treasury approved pay packages of $3 million or more for 54% of the 69 executives at the three companies whose pay was subject to government oversight, the SIGTARP report says. 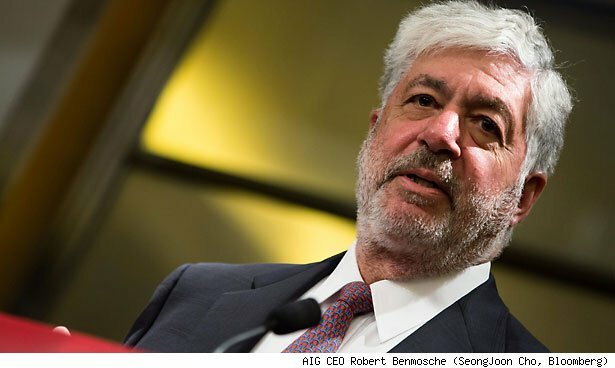 At AIG, CEO Robert Benmosche was awarded $10.5 million. Ally CEO Michael Carpenter received $9.5 million, while GM CEO Daniel Akerson got $9 million. None of the three received any long-term restricted stock as part of their compensation, the SIGTARP report says. Related: AIG won't join lawsuit against U.S.
GM spokesman Dave Roman said in an email that the automaker "is performing at its highest levels in years with a string of 11 profitable quarters and soon will have one of the industry's newest product lineups, while complying with all TARP restrictions." AIG spokesman Jon Diat said the insurer "has dramatically revamped its compensation practices to ensure that all employees are held directly accountable for clearly defined goals that reflect our commitment to properly balancing growth, profit, and risk." An Ally spokeswoman said the company had not had the chance to review the report. Last month, the government announced that it was selling the last of its remaining shares in AIG, having recovered roughly $204 billion on its original $182 billion commitment. Compensation at the insurance giant is therefore no longer under the government's supervision. The U.S. still owns 74% of Ally Financial, formerly known as GMAC, after committing $17.2 billion, an Ally spokeswoman said. The company has paid Treasury $5.9 billion on the investment thus far, she added. The government owns 19% of GM, having recovered roughly $28.7 billion on a commitment of $49.5 billion, a GM spokesman said. Patricia Geoghegan, the Treasury official in charge of compensation oversight, said in a response attached to the SIGTARP report that she disagreed with the watchdog's findings, and that the publication "contains many inaccuracies." At AIG, Geoghegan said, average compensation for top executives was at the 48th percentile "of similar positions at similar companies." At GM, compensation was at the 50th percentile, while at Ally, it was "mid-way between the 50th and 75th percentiles," Geoghegan said. How Much Is a Treasury Secretary Worth?